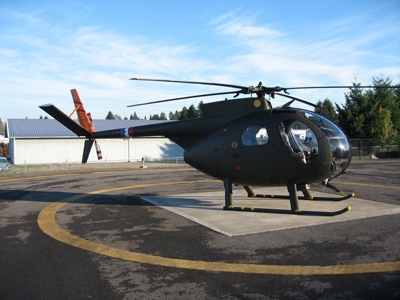 The end of January saw the much anticipated arrival of the OH-6 from Northwest Helicopters. 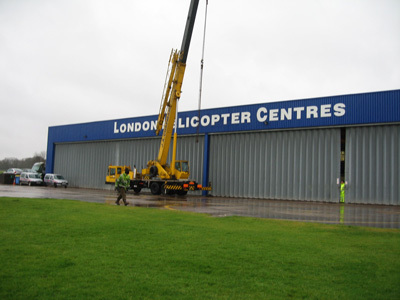 Following delays going through US Customs the container and its valuable cargo was due at London Helicopters Centre at Redhill on Thursday 22nd January after clearing UK Customs. 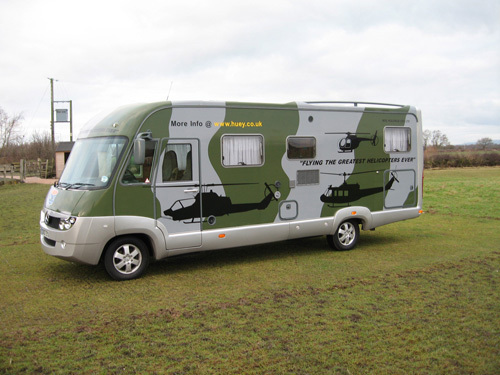 Plans were put in place for Bradley and I to travel down with Phil to help unpack and record the arrival of the latest addition to the Wesham Air Cav. This trip was also going to be a shakedown trip for the palatial new Huey Motorhome. Our plan was to hit the road at around 6 o'clock Thursday morning to get into Redhill around lunchtime for the arrival of the container. This would give us the best part of 5 hours to do the necessary last minute procedures, release the container and the crane brought in to unload it from the trailer. However things rarely go to plan and we got news that the OH-6 had been delayed and was now due at 10 o'clock Friday morning. With this information we changed our plans for a later start on Thursday to miss the heavily congested areas around Birmingham and the M25. This would then ensure that we were on site already for the early-ish arrival of Phil's latest toy. Phil picked us up from home shortly after 9 o'clock and we headed south on the M6. Progress was good with little traffic around the Manchester area and soon we were pulling in to the services on the M6 Toll for a light bite and a brew. After half an hour we headed off once again. Only this time Phil was not quite as happy with the way the Motorhome was running. There was a distinct lack of power; it happily plodded on but just had no power up any slight incline. The engine warning light had also come on. We reached for the manual and proceeded to read the information about what might cause the light to come on. We put a call into the firm who supplied it and they said there was nothing to worry about and that it was perfectly okay to keep driving. So on we went. We made the M25 by early afternoon and the traffic wasn't bad at all and didn't slow our progress. We arrived at Redhill just before 3 o'clock. London Helicopters very kindly allowed us to park up alongside their hangar and gave us a hook up to some electric. After a look around their hangar, some interesting machines in for work, we headed over to Huey 509. None of us had seen her since September when she was flown south by Rob Tierney to be ready for its annual inspection. She looked a little forlorn and dusty but just huge alongside the other helicopters nestling around her. Phil had a chat to Peter Locke and the LHC Engineers about the plans for the following day. The crane was due to arrive a 9 a.m. and the OH-6 in its containers was due at 10 a.m. Happy that everyone was up to speed the offices were shut and the three of us retired to our accommodation outside. A very entertaining and amusing evening followed with Phil donning the oven gloves and taking control of cooking our evening meal of lamb casserole (followed by a wee snifter). During the evening our conversation drifted around the OH-6 and plans for the morning along with looking forward to the next flying season. We also set our collective creative minds on a task of coming up with a few designs that might appear at some time or another (keep an eye on the Huey Website Shop)…..using the computer for this task proved an education as between our pooled knowledge of design, computing and picture editing we somehow managed to come up with some half descent ideas (okay so graphic artists would howl with laughter at our efforts but we were pleased as punch at having succeeded, well roughly, at what we had set out to do!). We retired reasonably early after our drive down south so that we would be refreshed in the morning and ready for the task ahead however something went awry with Phil’s alarm setting. In the morning he stumbled out of bed, got dressed and put the kettle on and it was whilst he was waiting for the kettle to boil that he put his watch on and checked the time ………… 5 am! So he crawled back into bed for another couple of hours - his excuse was that his alarm clock is square and can sit on any of its sides which gives false time… yeah right!! Up and breakfasted by 8.30 am we wandered around to the hangar to await the arrival of the crane and the OH-6. The rain which had come down by the bucket loads over night typically continued to fall. The grey heavy sky showed no sign of lightening or for the rain to stop. The crane arrived and parked up outside on the ramp. 10 o'clock came and went and no sign of the much awaited container. Phil phoned the haulage firm to see what was happening and apparently the truck had been delayed because of flooding as a consequence of the overnight rain and on the drivers route he had to find a way around a low bridge. ETA was now around 11 a.m.Fortunately we had taken heed of the weather forecast and taken our waterproofs which kept off the worst the weather could throw at us. Cold and wet none of us wanted to go inside and miss the arrival of the container. Just before 11 a.m. the crane was positioned outside the hangar doors so that the container could be dropped with the open end just inside under the cover of the hangar roof and a few minutes later in rolls the truck we'd all been waiting for.Now it was all hands to the pump as the trailer was positioned under the crane. A small platform was set up to put an Engineer on top of the container to attach the lifting chains. Slowly the big metal box broke free of the trailer. Inch by inch the container was lowered to the ground and swung in towards the hangar. A grinder was produced as every attempt to break the customs seal failed and with a few deft strokes with the cutting disc the seal came apart. The moment of truth and Phil stepped forward to open the doors. One by one he swung the locking bars and handles to release the doors. It was at this point Phil gingerly opened one door for a quick peek inside and promptly shut it again!!! Cries went up around the hangar asking if it was the wrong container!? “No it isn't” was Phil's response. We had had an inkling that Brian Reynolds at Northwest Helicopters might have packed a ‘little surprise’ and after due health warnings from Phil he opened the doors to reveal strapped across the entrance to the container a xxxxxxxxxxxxxxxxxxxx (sorry …censored…..Editor will not allow further details to be released!!). Happy all was in order and the aircraft hadn't suffered any damage in transit, work started in earnest to get the boxes and crates out. A forklift magically appeared to help with the task and soon all that was left was the ‘Little Bird’ itself. The ground wheels were taken into the container, the first set of wheels were attached but it was tight and the second set would not go on at all. 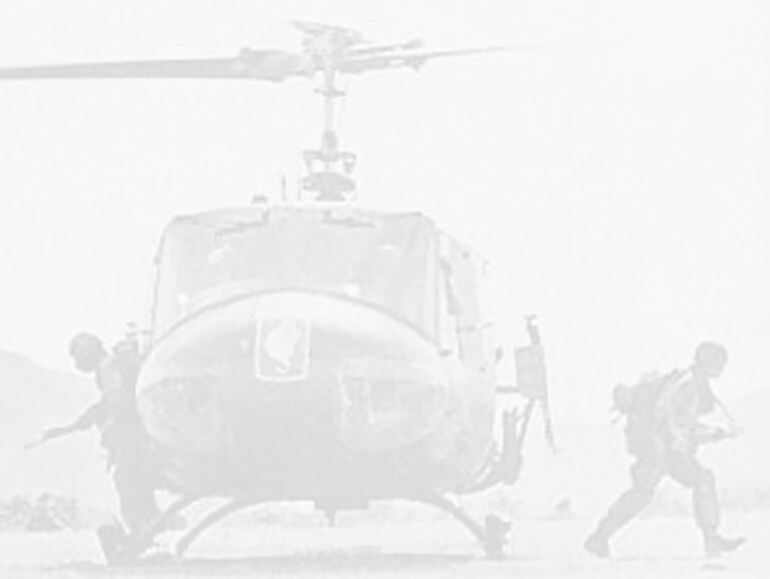 The problem was the skids had splayed out when the OH-6 had been racketed down. Now it was thought roller tubes under the skids would allow us to roll it out however a brave soul suggested we put a racket strap around the skids and pull them together. As the racket tightened skids began to move inwards giving the wheels the clearance they needed to just clear the container edges. A few millimeters made all the difference without putting undue strain on anything else. 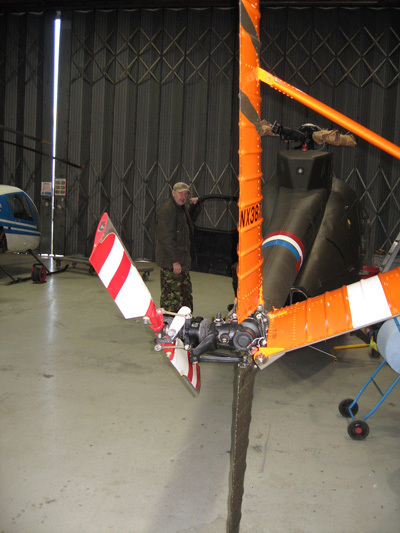 So far so good the tail boom emerged out of the container and into the hangar. Wooden blocks had been put on the floor of the hangar to act as a ramp out of the container. As the rotor head got close to the lip of the container it was a couple of inches too high. 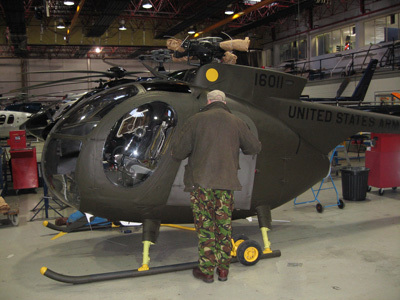 This was because Northwest Helicopters had lifted the OH-6 into the container with a crane using a lifting eye bolted to the rotorhead and we on the other hand had put it on the ground handling wheels, so between the two there wasn't enough clearance. The lifting eye was unbolted and removed giving that extra space required to finally pull the helicopter out of its metal box. In the clear light of the hangar it was given the once over again. The tail boom assembly components were removed from the cabin and no sooner had they been unwrapped than the Engineers started to fit them. In no time at all everything was in place ready for everything to be torqued up. The main rotors were not put on as it would mean the OH-6 would take up too much floor space in the hangar. These would go on at a later date. The crates of extra gear were put outside for collection by a wagon for delivery up to Lancashire and whilst this was happening the container was reloaded onto the trailer. Shortly after that the crane was packed up and it too departed. At this point we broke for a late lunch to return to finish off the labelling of the items to be taken by road up north. As we had completed everything by 4 p.m. we decided to head north and get home rather than staying overnight and driving up on the Saturday. I took to the wheel for the first time and soon settled into my stride. It didn't take long to feel the lack of power due to the engine being in 'get you home mode'. As one would expect on a Friday afternoon the M25 was slow but steady and soon we were onto the M40 and heading towards Birmingham. A brief stop at Warwick Services and we were on the road again arriving back home at 11 p.m. Quickly Bradley and I unpacked our gear and Phil continued to Wesham. 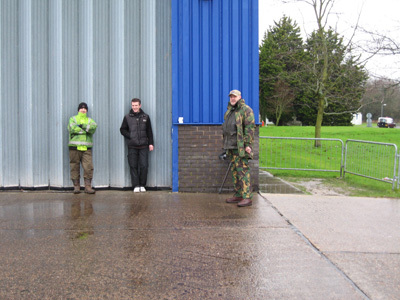 A good couple of days had passed by the three of us and we were all relieved to see the Loach safe on UK soil. Now comes the process of getting her cleared by the CAA to fly. Watch this space. On its return the Motorhome was taken to the dealership and it was checked out and the pipe to the turbo was found to have worked itself loose which explained the power drop. Pipe sorted and the engine checked over it was returned with its full power restored.